The first Jamaica Bay Wildlife Refuge Ruff of 2016 was spotted by Ken and Sue Feustel on Saturday 6-25-2016. Coincidentally, I walked in just as they saw the bird, having left the north end of the pond after doing trail clearing. While looking at this bird, I learned that someone had sent a text message during the week to a lucky few, indicating they had seen 2 Ruffs on the pond flying off. This report of the "supposedly Ruffs on the East Pond" never made it to the list serve and the source of this information remains a mystery...for now. Saturday's Ruff went missing on Sunday and there was no sign of this bird through Wednesday until Robert Proniewych reported a Ruff this morning at the south end of the East Pond. In another coincident, I was there this morning; one hour after high tide and I had walked the entire pond. I did not see a Ruff then. Now, this does not mean it was not there and I missed it but I am suspicious, pondering if this Ruff has a new spot somewhere outside of the pond. If true, this is great for the birds, bad for those of us who want to see them. Does this sound familiar? It should. In 2012, we had a Ruff that did exactly the same thing and showed up again. I wondered then if a reverse migration had taken place and this bird then returned after realizing it was heading in the wrong direction or is my theory of a suitable site nearby providing shelter and food applicable. To be continued as I am going to do a little exploration of a few areas I have in mind. In the mean time, compare the two poor quality videos shot with my iPhone and Spotting Scope of "the" Ruff. Once on 6-25-16 and again today. I am convinced it is the same Ruff and it gives us an idea of how quickly these birds lose their breeding plumage. This is an updated post Hurricane Sandy Jamaica Bay Wildlife Refuge East Pond Map as of 6-29-2016. As one who loves birds I would never be offended by the term "bird brain," although some people might. That term came from the belief that birds had brains so tiny that they were capable only of instinctual behavior. 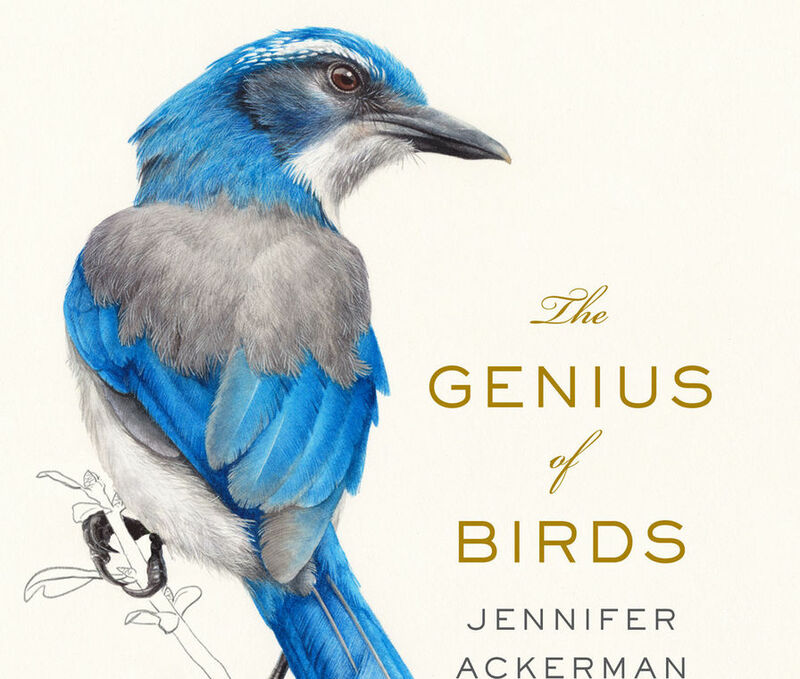 Jennifer Ackerman clears that up with her work in, "The Genius of Birds" where we learn birds are quite capable of using problem solving and social skills to navigate a competitive world. How incredible is it that the Clark’s Nutcracker stands out for its amazing spatial memory. This is a bird that stashes tens of thousands of seeds every year in thousands of different spots and remembers exactly where it stashed every one. What I would do for a "bird brain" like this one. Ackerman, skillfully presents complex scientific research in a way that even non-birders would appreciate. Each chapter discusses a bird skill such as intelligence, navigation and communication. While Ackerman does not delve into bird evolution she weaves important moments into her chapters where applicable. I enjoyed this book immensely and it has pushed me into doing additional field studies on bird behaviors. If you are interested in bird behavior and the similarities to human behavior this is a good read. It would make an excellent stocking stuffer for those friends who might not have this on their bookshelves as yet. 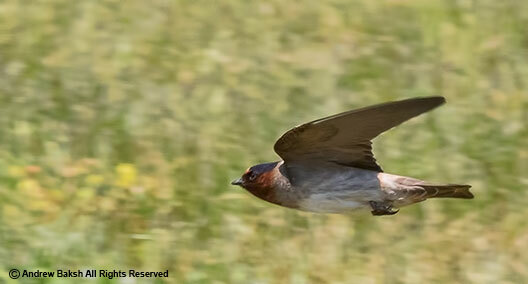 Cliff Swallow at Van Cortlandt Park Bronx NY. When I read the list serve posts about Cliff Swallows at Van Cortlandt Park in the Bronx, I was intrigued. In 2015, birder Matthieu Benoit reported 12 Cliff Swallows while kayaking in Pelham Bay on June 7th. 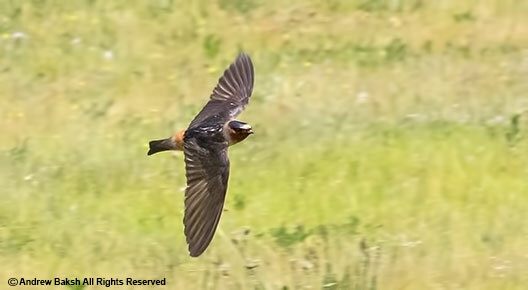 Jack Rothman, a Bronx resident and birder followed up on that report with a well documented photograph of a Cliff Swallow, feeding its young at a nest site in Pelham Bay. Unfortunately, I never got a chance to see any of those Cliff Swallows then so I was interested in trying for the ones at Van Cortlandt Park. On Monday, I made a rather late start and got to Van Cortlandt Park by 10:20 a.m., I quickly sorted out the location and shortly picked up my first Cliff Swallow hurtling along the play ground picking off insects. I would spend the next few hours watching them feed and working out, just how many there were. I felt comfortable that there were three Petrochelidon prryhonota present based on field observation and photos. 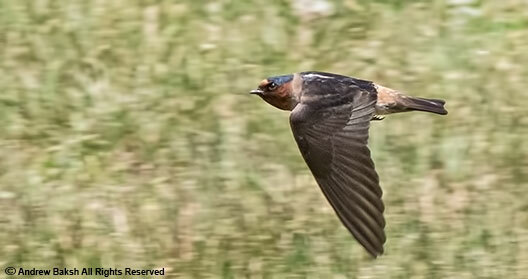 The presence of Cliff Swallows at Van Cortlandt Park should not be taken lightly. They are known to have colonies further north but in recent years keen birders have been recording nesting sites in Queens and in the Bronx. These birds prefer open areas for foraging, with open water and a source of mud for nest building (Bull 1964). The habitat as you could see is of the utmost importance. Something, that is lost on those who are supposed to be guardians of the last remnants of the little green spaces we have left in our city. As I read the list serve posts and subsequent eBird posts of those who tried and saw them, I could not help but feel a bit irritated that I never heard from many of these same folks when word broke that there is a plan afoot to pave the Putnam Trail. A 1.25 - mile long nature trail that runs along the abandoned Putnam Railway, not far from the site that is now hosting Cliff Swallows. That means, tree removal and asphalt. Disturbance, is never good for wildlife but the jury is out on how much negative impact, this project will have on our local breeders. In the meantime, lets enjoy those birds and wildlife while we can. I did just that, while thinking how wonderful it would have been to show them to the late Alex Pirko a VCP regular. Who knows, maybe he saw them there before. When I received the news from Minty of Alex Pirko, passing away I was very saddened. Alex, lived alone and as far as I know, no family nearby. He was found dead in his apartment by a neighbor who had not seen him for awhile.While Alex was neither a blood relative nor someone close to me, he was someone from my birding family. A guy I met while leading walks at Van Cortlandt Park in the Bronx NY. A quiet, soft spoken gentleman, Alex was one of the first attendee to go out with me when I began leading walks at VCP. He loved the park and birds and I loved that he enjoyed both. During the time I led the walks, he never missed a Saturday except when it snowed really bad or his body failed him. He showed me what he knew about the park and in return I got him new birds and was rewarded with his joy at new lifers (birds seen for the first time) that I found for him. Over the time that I led the VCP walks, I saw Alex regressing, losing some of his sight as well as mobility. As a result, he slowed down and even expressed to me that he did not want to slow down the group, such was his concern for others. Realizing that, I paced the walks so that he was never left behind or felt he was a burden. Unfortunately, I stopped leading the VCP walks due to differences I had with the VCP Admin and NYC Audubon on plans to pave the Putnam Trail. Alex, then had expressed his disappointment and threatened to stop going to the walks. I was touched by his loyalty but encouraged him to keep on attending the walks and to ignore the politics. Alex (L) with the 2011 VCP Birdathon winners. We kept in touch, along with other regulars from the walk and I helped him a few times with bird identification. As time went on our communication became infrequent though, I did ask others about his well being. I found out that he would be seen sometimes in the park but not with the group. Despite his health issues, Alex came out in 2013 to support a video that was made by Will Sanchez who was trying to bring the Putnam Trail issue to the screen. The sincerity of Alex's love for the birds came through with this quote - "And sometimes there's something out of the ordinary that pops up that is amazing, and people come from all over to see it". - Alex Pirko, 2013. The footage with his statement can be seen here. I fondly remember the few memories with him like the VCP Birdathon which our team won in 2011, the time I got him on a Swamp Sparrow and watching him break out in that smile of his. Having him tell me about his Yellow-headed Blackbird that he found in VCP--the record, is still up on the NYSARC (New York State Avian Record Committee) website. I wished I had done more for Alex, he was a gentle soul that could have used more companionship and friendship. These days, so much emphasis is put on young birders with very little attention to the older birders. We should not forget the folks like Alex, they need our love and attention too. R.I.P. dear Alex, may the after life be filled with the songs of the birds you loved so much. 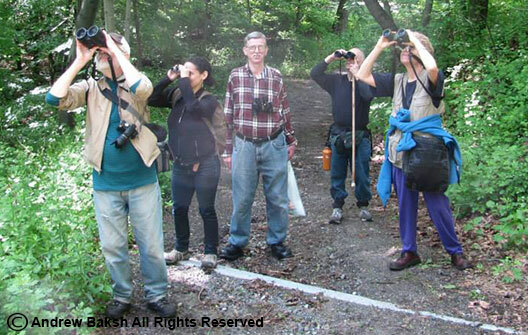 On May 12th, I joined a team of Audubon NY staffers and volunteers in the annual Audubon New York Birdathon. 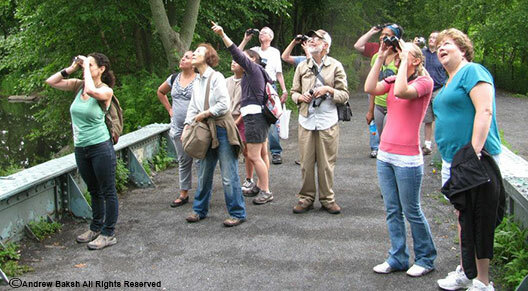 The Birdathon is a fundraiser and citizen science effort that increases awareness of Audubon’s mission and raises valuable funds for leading conservation work throughout New York. There were two ways one could have participated: either by pledging to support a team or by joining it. 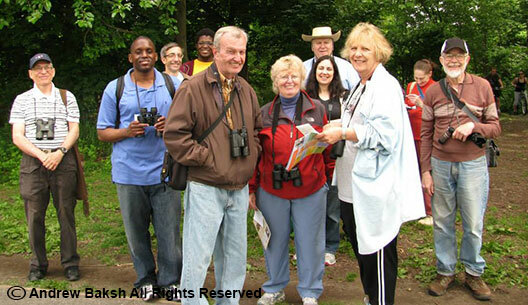 Participants had the option of joining for all or part of the day’s birding activities and anyone regardless of their level of birding skill level could participate. Some of the team members. I decided to join the Long Island Team consisting of: Amanda Pachomski, Bill Keasler (guest), Diana Ngai, Julie Nelsen, Kathryn Burke (she was out at Orient), Kathryn D'Amico, Kayleigh Mahoney, Seren Bagcilar and Sharon Hirschhorn. It was a good group with a mixed skill level. I have participated in several Birdathons and birding competitions; this one was not as intense which was just fine with me. The team was very good at helping each other get on birds and slowly but surely our number of birds began to build. Our sites included, Caumsett State Park, Orient Beach State Park, Jones Beach Coast Guard Station, Tobay Beach, Patchogue NY, Big Egg Marsh Queens, Theodore Roosevelt Nature Center, Forest Park Queens, Nassau County, Lefferts Blvd Queens (my Monk Parakeets nest stakeout) and Jamaica Bay Wildlife Refuge. I am sure I might have missed a few locations but you get the idea of how much ground was covered. 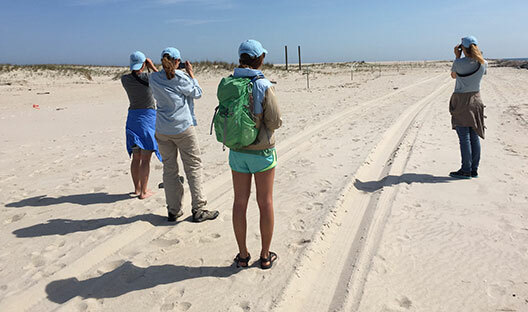 Team members looking for Piping Plovers at Jones Beach. 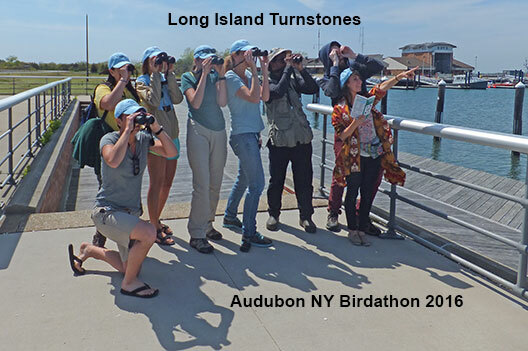 In the end we totaled 145 species seen and as of May 16th, our team, who I will christen "The Long Island Turnstones" were leading all other teams that participated. Donations to support our team could be made to : https://give.audubon.org/Giving/Page/192/1/192 look for Amanda Pachomski in the drop down list from the "choose your birder" field. Any amount would be greatly appreciated and put to good use. I am looking forward to next year where we will try even harder!